Some years I have made a special breakfast for Valentine’s, but this year I just made a dish that is a favorite with my kids — baked apple french toast. We started our day of “Valentines School” with fun printables. 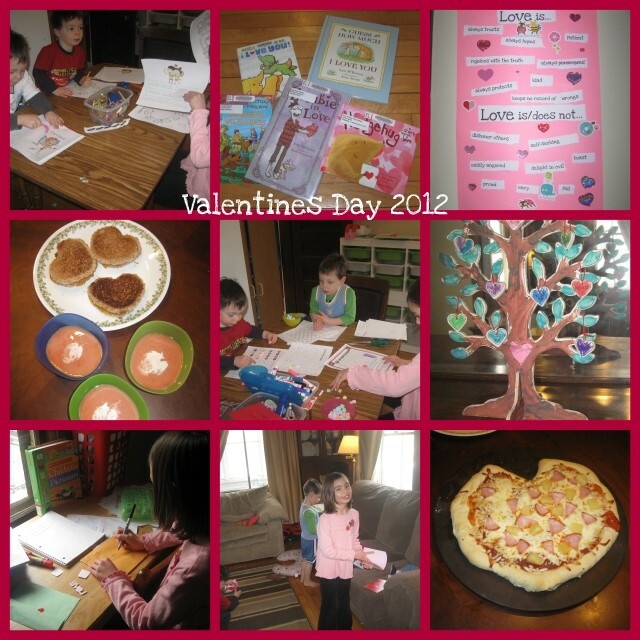 Everyone enjoyed the Valentines Early Learning Printables from Homeschool Creations. I also printed a couple of Valentine’s word searches for Miss M.
After everyone was bored of working at the table, we read a stack of books related to love or Valentines. Most were selected by the kids during last week’s library trip. I selected the classic “Guess How Much I love You” from our bookshelf. None of the books the kids picked out were particularly classics, though “Zombie in Love” did get several readings this week at our house! I also re-read with Miss M the chapter from Mystery of History II on the true origins of Valentines Day. Following the theme of love, we read 1st Corinthians 13, the traditional “love chapter” in the Bible. I printed out the key words from the “love verses” and had the kids put the verses into categories of what love is or is not and we discussed those qualities of love. The kids were very excited to decorate the poster when they were done. After lunch it was time for candy math! Using inspiration and printables from several sites (here, here, here, here and here) we tore into a bag of conversation hearts and went to work. Miss M and Mr E both most enjoyed making a graph of the colors of candy hearts in each of their bowls, while Mr. K’s favorite activity was making patterns. Miss M took some time to finish a “Heart Tree” craft kit she started last year at Valentines, but never finished. It’s now decorating our buffet! After that, she finished addressing envelopes to mail a few valentines. Yes, our recipients got them a little belatedly since they went in the mail on valentines! This was Miss M’s first time addressing envelopes on her own, and it was a good practical lesson on our fun “valentines school” day! We went out to drop off a few valentines at neighbor’s houses and take our larger envelopes to the post office. Upon returning, we opened valentines mail and gifts we received! We rounded out our special day with heart shaped pizza, homemade white chocolate pudding with strawberries and special drinks that daddy brought home. I’m linking up with Love-ly-ideas at Homegrown Learners! I’ll be looking forward to reading what other bloggers have posted and bookmarking or pinning ideas for next year!